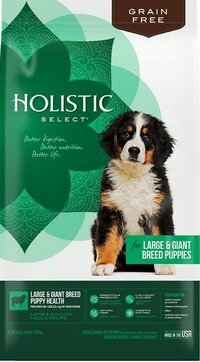 That’s because the nutritional needs of large and giant breed puppies are different from those of small and medium breeds. 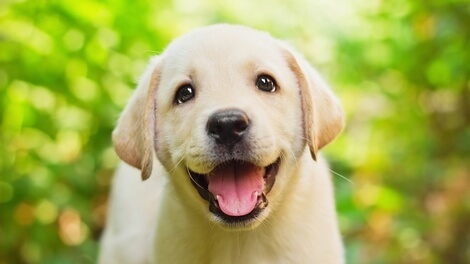 A Labrador retriever can grow from just under a pound at birth to over 70 pounds in a year. That’s a whopping 70-fold increase in size in just 12 months. In comparison, a human being can take 18 years to achieve results that are less than half that much. Rapid growth means the bones must change quickly, a factor that can put them at risk of forming improperly. And it is this remarkable rate of growth that makes large and giant breeds so prone to hip disease. 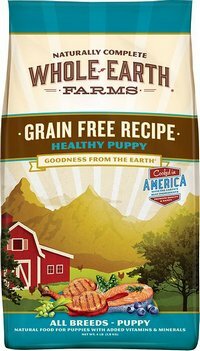 Unfortunately, the Internet is awash with misinformation about how to feed large breed puppies. 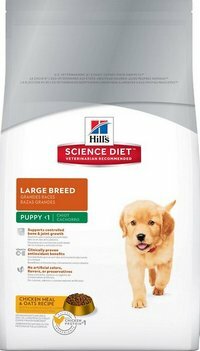 For example, many insist that high levels of dietary protein can lead to hip dysplasia. 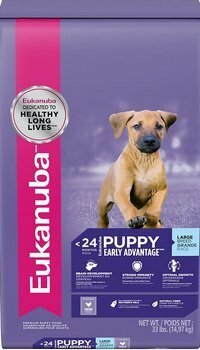 It’s important to avoid feeding too many calories or too much calcium, two factors that can significantly increase your puppy’s risk of hip dysplasia. 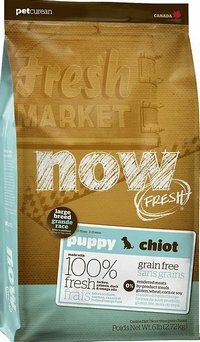 Free choice is a popular feeding method in which the food remains in the bowl and continuously available — so a puppy can eat whenever it wants. 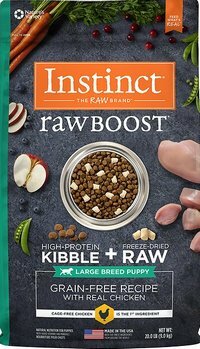 Sadly, many owners of large breed puppies mistakenly believe that this form of uncontrolled eating is the correct way to feed their pets. 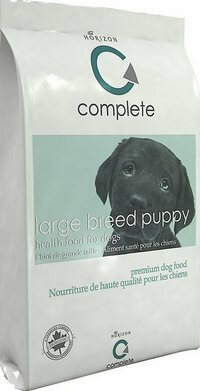 But free choice feeding can cause a puppy to grow too fast and lead to permanent bone damage. The restricted calorie group experienced a much lower incidence and later onset of hip joint arthritis. Feeding too little calcium can also lead to problems. 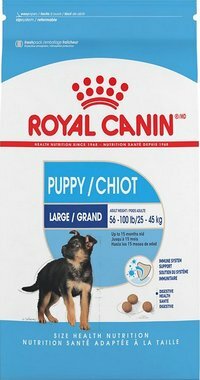 That’s why it’s so important to feed a dog food that contains an amount of calcium that’s safe for large breed puppies. 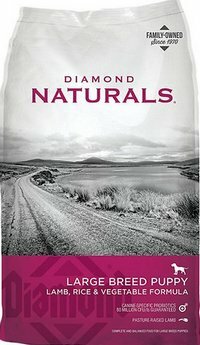 Here are The Dog Food Advisor’s top 15 best large breed puppy foods for April 2019. Label analysis reveals a dry matter protein content of 32%, a fat level of 14% and an estimated carbohydrate share of about 45%. Label analysis reveals a dry matter protein content of 31%, a fat level of 16% and an estimated carbohydrate share of about 45%. Label analysis reveals a dry matter protein content of 39%, a fat level of 16% and an estimated carbohydrate share of about 38%. Label analysis reveals a dry matter protein content of 30%, a fat level of 14% and an estimated carbohydrate share of about 48%. Label analysis reveals a dry matter protein content of 31%, a fat level of 17% and an estimated carbohydrate share of about 44%. Label analysis reveals a dry matter protein content of 37%, a fat level of 17% and an estimated carbohydrate share of about 38%. Label analysis reveals a dry matter protein content of 29%, a fat level of 16% and an estimated carbohydrate share of about 48%. Label analysis reveals a dry matter protein content of 31%, a fat level of 13% and an estimated carbohydrate share of about 47%. Label analysis reveals a dry matter protein content of 32%, a fat level of 15% and an estimated carbohydrate share of about 45%. Label analysis reveals a dry matter protein content of 32%, a fat level of 18% and an estimated carbohydrate share of about 42%. Label analysis reveals a dry matter protein content of 31%, a fat level of 19% and an estimated carbohydrate share of about 42%. Label analysis reveals a dry matter protein content of 43%, a fat level of 18% and an estimated carbohydrate share of about 30%. Label analysis reveals a dry matter protein content of 29%, a fat level of 13% and an estimated carbohydrate share of about 49%. Label analysis reveals a dry matter protein content of 30%, a fat level of 17% and an estimated carbohydrate share of about 45%. 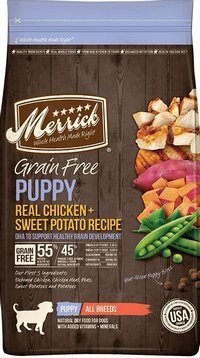 It’s now possible for you to be 100% certain ANY food you buy is safe for your large breed puppy. 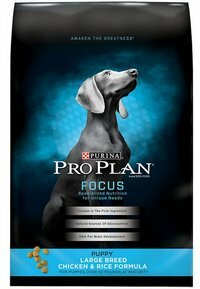 The written assurance you need is printed right there on the label of virtually every commercial dog food. It’s a simple, easy-to-read sentence known as the Nutritional Adequacy Statement. And scientific data published by the National Research Council of the National Academy of Science. 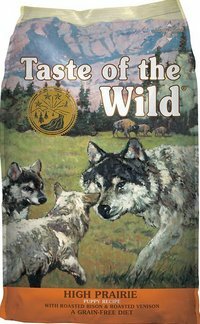 You want to be certain the food meets AAFCO nutrient profiles for either “Growth” or “All Life Stages“. 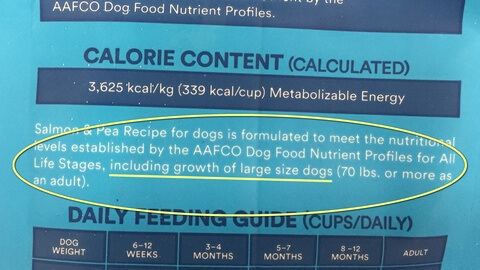 That it ALSO reads… “including growth of large size dogs“. That last phrase is SUPER IMPORTANT! 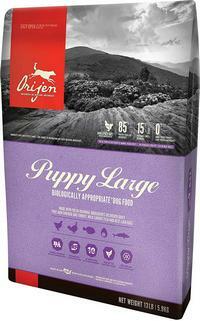 You should assume the food contains too much calcium… and is NOT SAFE for your large or giant breed puppy. 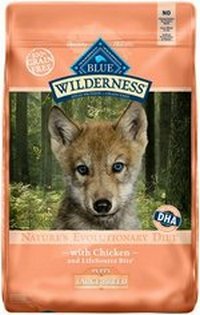 Your Puppy to Adult Food? Large breeds puppies (like Labs, Goldens and German shepherds) don’t reach adulthood until 12 to 18 months. And giant breeds (like Great Danes and St. Bernards) can take up to 24 months before they’re considered adults. 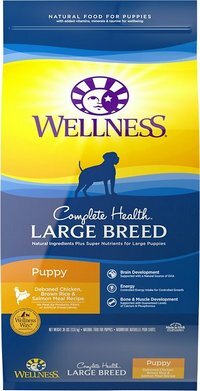 Switching your large breed puppy to adult dog food too soon can significantly increase your pet’s risk of hip dysplasia.